In our experience nobody does a great burger like a great steakhouse. Morton’s The Steakhouse SRF Wagyu Bacon Burger is comprised of Snake River Farms Wagyu, Cambozola cheese and pickled shallots and is topped with a farm-fresh fried egg on a brioche bun with bacon onion jam. It’s a great way to celebration National Burger Month or any month. If you love burgers and golf, swing by Loft18, the premier indoor golf and social club in Old Metairie. Their Bourbon Burger is topped with Bourbon-infused onions, spiced black beans, fresh avocado, cheddar, Monterey and jalapeño – all dripping with house-made hickory sauce. It’s so good you’ll have no trouble making a hole in one (sorry). You haven’t lived till you tasted the Foie Gras Burger at SoBou, served on a brioche bun with a sunny-side up egg, duck bacon, foie gras fondue and a mini Abita root beer and foie gras ice cream float. Your friends back home will ask you if you had gumbo on your trip, but you’ll want to talk about this. 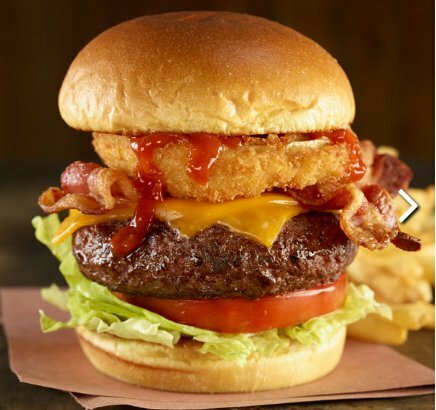 There are eleven burgers on the Hard Rock Café menu and while we can’t vouch for them all, suffice it to say if you’re a burger lover you’ll be happy here. Add a shake and you’ll be positively giddy. Nothing goes with beer like burgers! The Gastro Pub Burger at Gordon Biersch is topped with house-made bacon jam & bleu cheese sauce, mixed greens, tomato, gorgonzola cheese and caramelized onions. For a few dollars more, you can make it a ¾ lb patty or substitute Kobe-style Wagyu beef. Nummy. This Metairie restaurant is famous for its Sicilian Burger, Grandma Marcello’s meatball recipe pressed into a patty and served on warm French bread. You can order it dressed or with red gravy and Mozzarella cheese. Either way, it's delicious and 100% New Orleans. This Old Metairie restaurant has a Build-Your-Own Burger that gives new meaning to the phrase, "Have it your way." Along with lettuce, tomato and pickle you can have your choice of American, blue cheese crumbles, cheddar, Swiss and provolone. This places has a great Fried Green Tomato appetizer as well. That's what we like about the South! For more than 50 years, folks have been getting their burger fix at Port of Call, known for their huge, shredded cheese-topped burgers, served alongside a loaded baked potato. The only thing wrong with this burger is they only serve it at lunch. The burger here is a blend of beef and pork with cheddar cheese, bacon, pickled squash and herbed aioli on a sesame seed bun. It’s melt-in-your-mouth fantastic. You’ll be so glad you’re not a vegetarian. While the servers in the bow ties are charming, the real reason people line up to get in here is the cheeseburger, grilled up right before your eyes. If you can leave before sharing a piece of pecan pie, you’re better people than we are.